A move to summer could be very good for Agents of SHIELD’s future. A familiar voice has been found for the Sonic movie. ABC has hopes for Agents of SHIELD’s future beyond the next season. Morbius could be casting an important figure from the character’s past. Plus, creepy teases for American Horror Story: Apocalypse, and James Wan on Aquaman’s connections to the rest of the DC universe. Spoilers! Variety reports that Jean-Ralphio himself (and BB-8 and Dewey Duck), Ben Schwartz, has been officially cast as the voice of Sonic the Hedgehog. That Hashtag Show reports Michael Morbius’s fiancee, Martine Bancroft, will be the film’s female lead. Speaking with Entertainment Weekly, James Wan stated that Aquaman does not include cameos from Arthur Curry’s fellow members of the Justice League. I wanted to keep the story to the world of Aquaman and not have to worry about what other characters are doing in their films and how that would affect us. I just thought the simplest way was to keep it clean — keep it simple and let it be an Aquaman story. I told them I understand and respect that it’s part of a bigger universe but at the end of the day I have to tell the story I want to tell, and I want to develop the character as well. Idris Elba gave Empire an update on his adaptation of The Hunchback of Notre Dame. The film at the moment lives entirely in my brain. I’m very fortunate to have a classic tale to reinvent. So now it’s about how I execute it. I’m definitely taking on more than I’ve ever taken on in any other project, with the hats that I’m wearing. But, hey, man, that’s why I’m here. I’m an entertainer, right? I liken it to an athlete being asked to do a triathlon: okay, show me what you really got. Speaking with /Film, director Jake Kasdan confirmed the next Jumanji will continue referencing the 1996 original. Our hope is to keep a long continuity through the whole thing, even though the story that we’re telling in the second movie, the movie that we’re working on right now is much more connected to the first movie that I made a year ago than it is to the original. We love the idea of keeping all of this together and connected in some way or another. However, Kasdan denied the series would rope in Chris Van Allsburg’s similar, outer space-variant on the story, Zathura. I love Zathura but we haven’t really treated it as being quite related, directly related. 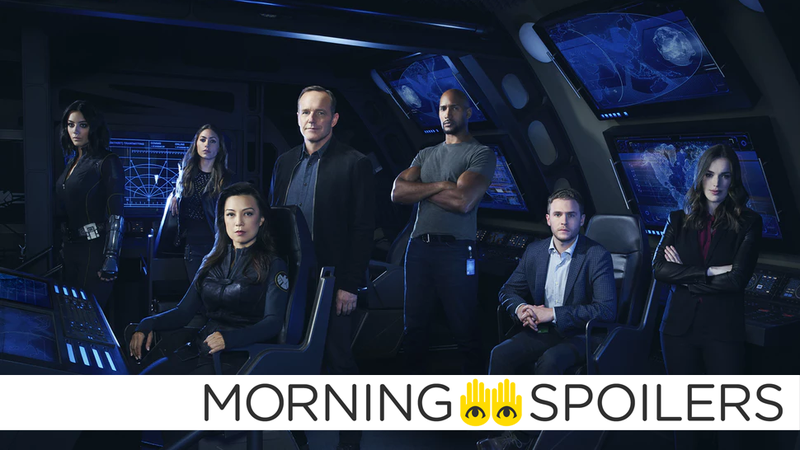 President of ABC Entertainment Channing Dungey revealed Agents of SHIELD “might be able to continue for longer” in its new summer 2019 time slot. It’s my hope that by moving it to summer, where our live-same-day ratings are less important, it might be able to continue for longer. Spoiler TV has images from the Charmed pilot. Head over there to see the rest. Satan and a baby shake hands in a new teaser for season eight. A second, longer teaser includes atomic blasts and an albino scorpion fight. Finally, pay a visit to Castle Rock in a new 360-virtual reality video from Hulu.